No matter how “paperless” healthcare organizations become, it seems inevitable that hospitals will still have to deal with some form of the handwritten word, making it necessary to have strong policies and procedures in place. As hospitals transition from paper to electronic medical records, they are working in what is commonly referred to as a hybrid environment: a combination of paper, EMR, and document imaging. Maintaining order in this setting can be challenging for HIM departments, which need strong oversight from diligent HIM directors and a sound communication strategy to succeed. At Rochester General Hospital, HIM Director Barbara Gerringer, RHIT, says the hospital began its adventure into the hybrid world by scanning its emergency department records, followed by lab and ancillary reports such as radiology and typed records such as discharge summaries and operative reports. All are now available electronically in their EDCO electronic document management system (EDMS), which serves as the organization’s EMR and legal medical record. Gerringer says the goal is to have records scanned within 24 hours of a patient being discharged. Coders do their coding from the scanned document, and doctors complete their deficiency reporting online. Melissa King, technology solutions consultant for Standard Register Healthcare, says the hybrid medical record environment is not going away anytime soon. “It’s not just a bridge or a short-term solution. It’s probably going to be around as long as EMRs,” she says. “I would recommend that hospitals embrace the hybrid environment. Too many times we hear hospitals say that the forms are within the EMR and they don’t do anything further with it. Hospitals need to put processes in place to effectively manage the existing paper environment in a way that complements the core EMR system. “For instance, we had a hospital that had achieved level 7 EMR adoption that was still spending $1 million on paper costs. … We needed to look at that to effectively put processes in place to better manage the paper environment so it can complement their core system,” she adds. Working in a hybrid environment requires effective policies and procedures. Deb Gustavsen, PhD, vice president of healthcare consulting for North America at Iron Mountain, says, “Organizations in transition between paper and electronic are struggling with defining their legal medical record. Is it the paper record or is it the electronic record?” Providers can fall on either side of that question. Gustavsen says some consider the paper chart to be the legal record, while others are printing everything that’s available electronically or born electronically. A legal medical record, as sanctioned by the AHIMA, is described as residing wherever a document was born. For example, if it’s information created from an electronic database, then that constitutes the legal record. “This gives health systems the ability to turn off the printer. The problem is when clinicians and HIM professionals don’t have the media available or the ability to view the record online. Of course, it needs to be maintained in a paper form so it’s accessible,” Gustavsen says. At Rochester General, the importance of defining what constitutes a legal medical record and making sure everyone understands what that entails cannot be overstated, says Gerringer. “Rochester General Hospital defines its legal medical record as the EDCO EDMS. Anything that’s scanned is part of the legal medical record,” she says. As Rochester General rolled out its EMR, HIM staff were assigned to the units. “Anytime a doctor needed to do something where he needed assistance, he would grab one of the HIM staff members and they would help with the process,” Gerringer recalls. 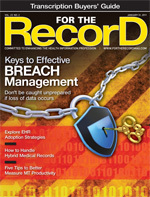 There are several common errors that occur when healthcare organizations manage records in a hybrid environment. For example, searching for documents in the system can be challenging. “We discovered that when the doctors were looking for a particular record and couldn’t find it, they might not have been looking in the right location. They would think the record hadn’t been scanned only to have the HIM staff help them find the record,” Gerringer says. If a doctor searches for a diagnostic report, the HIM staff make sure a crosswalk is created. The crosswalk structure includes headings such as discharge documents. Under that heading there are subheads, including items such as discharge instructions, discharge summaries, and admissions paperwork. Ancillary reports, including radiology and cardiology, follow below the subheads. Iron Mountain advises clients not to circulate the entire chart or original. Instead, it recommends scanning selected portions that meet patient care requirements. “One organization we worked with scans the documents, then locks them in cabinets throughout the hospital. That’s how seriously they’re taking their legal medical record,” Gustavsen says, adding that some organizations print on paper what everyone knows is not the legal record because it’s either watermarked or fluorescent, a surefire sign no one intends using it in legal matters. However, it can be reviewed for inaccuracies that are then reflected in the legal record. Rishi Bhalerao, product manager for Iron Mountain’s healthcare division, says hospitals are often unprepared for the challenges they face within the hybrid environment. “I think many healthcare organizations are caught by surprise at how difficult it is to manage the transition from paper to electronic. What we found useful is having some level of an imaging service that keeps all records in a single location,” he says. Many hospitals feel the need to scan all paper documents, which is a common misconception, according to Bhalerao. “We suggest they scan selected and more recent records,” he says. As hospitals transition from paper to electronic and as more EMR modules roll out in their environment, there is often a top-loaded demand. “They have a lot more up-front scanning, which will eventually decline over time,” Bhalerao says. System downtime is another area where hospitals operating in a hybrid setting are vulnerable. Steadfast policies and procedures regarding such an occurrence are essential, King says, adding that hospitals will most likely need to revert to paper if the EMR goes down. Some hospitals are looking at ISO 9000 standards for document management as a solution. (ISO 9000 standards are generic and nonprescriptive and leave to each registrant how the standards will be met. Theoretically, this allows ISO-registered hospitals to innovate healthcare design, delivery, and administration.) “They need to make sure they have compliant documentation whether it’s paper or electronic. In a hybrid environment, downtime transitions should be automatic whether you are moving from paper to electronic or electronic to paper,” King says. Unfortunately for Florida Hospital, its HIM staff had little expertise in this area. To compensate, it partnered with a vendor that introduced a program in which it would handle front-end ROI functions (eg, customer service, reviewing and processing requests), while the hospital would take care of the back-end tasks. Managing ROI requests in a hybrid environment is somewhat of a hybrid, too, Gerringer says. Physicians dictate and information is typed into the dictation system and then imported to the electronic system. Written progress notes from the nurses or physicians are also scanned into the EMR.